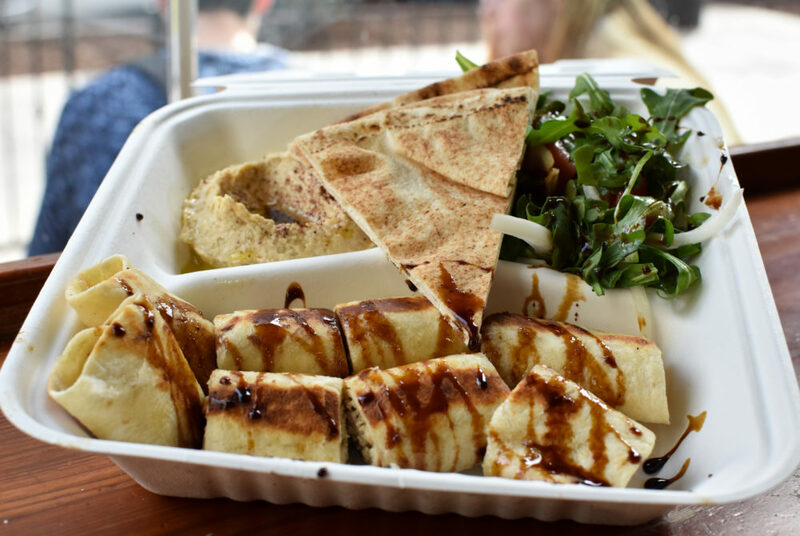 The Syrian combo meal ($9.99) allows customers to try each one of the chef’s dishes with its inclusion of two chicken shawarma wraps, and sides of hummus and pita and arugula salad. The next time you head into Whole Foods, skip the hot bar and kiosks and order from Foodhini – a food stall that serves up delicious Syrian fare while supporting refugees. Located at the Whole Foods at 2201 I St. NW, Foodhini – a D.C. food incubator and delivery service that focuses on immigrant chefs – has been operating a food stall since January, which will consist of three-month rotations of different immigrant and refugee chefs. Majed Abdulraheem, a Syrian immigrant who fled his country due to the war, is currently occupying the Foodhini stall and serving up chicken shawarma wraps ($6.99), hummus and pita ($3.99) and salata jarjeer ($6.99), an arugula salad. But to fully experience the magic of Abdulraheem’s food, the chef’s Syrian combo meal ($9.99) is a must. The combo meal not only comes at an affordable price, but it also allows customers to try each one of the chef’s dishes with its inclusion of two chicken shawarma wraps, and sides of hummus and pita and arugula salad. Patrons of the Foodhini stand have the opportunity to watch Abdulraheem craft each chicken shawarma wrap, carefully applying olive oil to the grill and ensuring that each wrap has the ideal amount of crispiness. 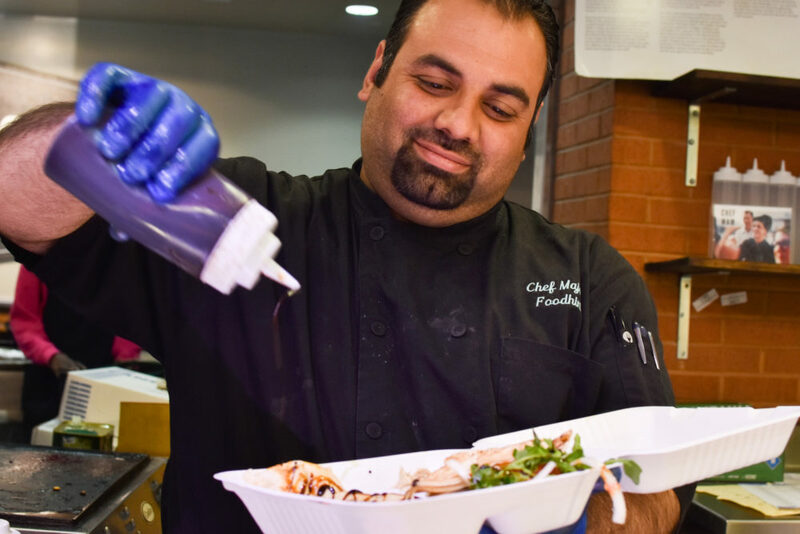 He also hands each to-go container directly to the customer, making for a personal experience that restaurants around the District often do not offer. Majed Abdulraheem, a Syrian immigrant who fled his country due to the war, runs Foodhini and serves up chicken shawarma wraps ($6.99), hummus and pita ($3.99) and salata jarjeer ($6.99), an arugula salad. The chicken shawarma wraps consist of a chopped up chicken breast, pickles, mayonnaise and a drizzle of pomegranate molasses on top, which is enclosed in a thin but sturdy tortilla-like wrap that is cut into small segments – four for each of the two wraps – making them easier to eat in bites. While I was skeptical of the mayonnaise in the chicken shawarma wraps, I was pleasantly surprised as it provided a slight creaminess and helped prevent the chicken from becoming dry. The pickles were tart and briny and added essential flavors and textures to the shawarma wraps that would not have been present if the meal just consisted of chicken and mayonnaise. But the addition of the pomegranate molasses, which was drizzled on top after the shawarma wraps were taken off the griddle, was by far my favorite part of the dish. The sweetness of the molasses balanced out the savory elements of the wraps, especially the pickles. The arugula salad was simple with just some tomatoes and onions mixed in, but it packed a punch with a tangy lemon vinaigrette. And while the pita itself was simple, the hummus made up for everything the pita didn’t have. The hummus was smooth, had a slight spice from the paprika sprinkled on top and was extra creamy from the olive oil, making me remember why packaged hummus almost never stacks up to homemade. Foodhini’s Syrian combo meal was not only well balanced and tasty, but it served as a fresh change at this typical GWorld destination.